It’s been quite a while since Marvel Studios introduced us to a new franchise. In fact, one could argue the last time was Ironman in 2008 since all the following film were interconnected through S.H.I.E.L.D. and other cameos. Guardians of the Galaxy, which opened in theaters today, represents something completely new in that universe; and could have been a tremendous flop. Oh wait a minute, it’s Marvel Studios. They don’t do flops. So how does Guardians of the Galaxy hold up? Will it be worth your time and money; or did all the trailers get you excited for nothing? Well, I can honestly say Marvel has done it again; but I can give you more than that. So here is a SPOILER FREE review for all of you who have yet to see Guardians of the Galaxy. As we learned from the trailers, this is your usual ‘group of misfits unit to become heroes’ story; but there is nothing simple about it. Unlike other films of similar type, nothing here really happens by chance. There are motivations behind their team up. There’s no quick set up or something to avenge. Instead, we honestly get to see how five very different yet similar characters choose to not only fight together; but also stay together. There are also a ton of deeper complexities and side stories in this film that can be explored in later films; but not once does it take away from the main driving narrative – nor leave you feeling you missed something. This film gives the perfect balance of explaining what you need to know and leaving a little bit extra for you to read between the lines. It’s also important to note that we finally get to learn just what the so-called ‘Infinity Stones’ are, so get ready for a history lesson. The only thing more amazing than the characters in this film is how incredibly complex they are. All of them have a depth behind them that this movie does a great job of making clear. Though these moments of ‘personal revelation’ don’t take away from that action in one bit. There’s no filler; it’s all one fluid experience. Even the villains hint at more than you see. From the Collector to Thanos, each has their apparent actions; and yet still holds onto something left to be seen in future films. Although the true show stealer is Rocket Raccoon. From his quick whit, exceptionally high intelligence and snarky remarks he is basically Tony Stark in furry woodland creature form. Seriously though, I can’t wait to see those who on screen together. Then again, you could probably have guesses that from the trailers/commercials; but don’t for a second think that you saw all there was to see. One notoriously bad habit for some films is to show all the bet moments in the trailers – *cough* Transformers 4: Age of Extinction *cough cough*. Whereas it makes sense why films do this, all it does is leave movie goers with a feeling of betrayal and inadequacy in their gut. Thankfully, Guardians of the Galaxy did not make this decision when piecing the trailers together. In fact, I think the best moments of the film weren’t seen in the trailers at all. The trailers were pretty amazing and hilarious to begin with; but the film itself is easily 10x better. I honestly haven’t loved a space flick this much since the original Star Wars. Is it perfect? No; but what movie really is? From comedy to tear jerking moments, this is one of the most eclectic films I’ve ever watched; and I was thankful for every minute of it. This film takes you on an amazing journey that has something for everyone from the die-hard fans to those who aren’t familiar with the Guardians of the Galaxy. Seriously, do people even need to ask that question anymore when it comes to Marvel movies? As expected, there are not one; but two post credit scenes – well one mid, one post. As for what the spoilers mean, you’ll have to check out my spoiler-filled Top 10 Easter Eggs in Guardians of the Galaxy. 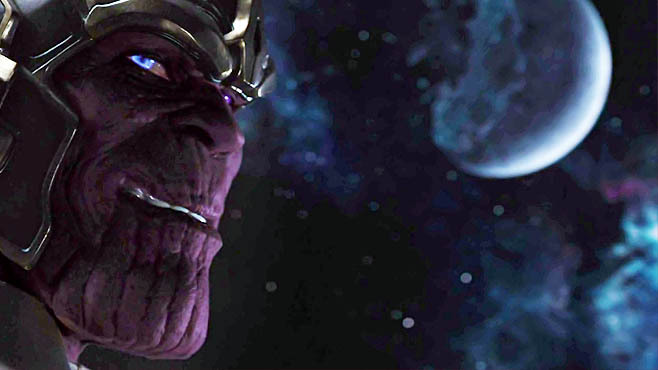 If you though mentioning Thanos was a spoiler, sorry; but he’s been confirmed for this movie for a LONG time. So there you have it. Marvel Studios has done it again. If Ironman and all of them were B class Marvel superheroes before their movies, then the Guardians of the Galaxy are probably C class in terms of notoriety. Despite that, this film is one of the best Marvel has put forward, and continues their new and improved quality of storytelling of that Captain America 2: The Winter Soldier started. This just goes to show that no mater what film franchise they attempt, Marvel Studios knows how to bring these comics to life in brand new ways that bring out the child in all of us.